Cnoc an Teampuill is an enigmatic mound to the southwest of Foulis Castle. From above it is D-shaped and orientated northeast-southwest, approximately 21m by 18m. It appears to have a raised, level, rectangular area to the northwest, gradually sloping to the southeast. There is currently no visible evidence of any structure and the feature is covered by modern field clearance stones. There is a cup marked stone (probably not in situ) on the southeast side of the spread of stones. Group observing the cupmarked stone. The field is known as Churchyard field, but there is no exact record of a church or chapel existing at the site. 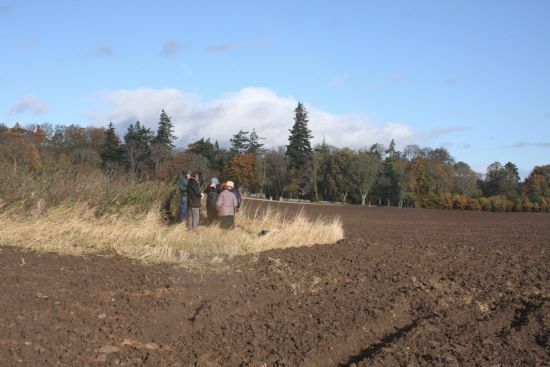 It is possible that a structure related to a chapel or early religious site has existed at this location but had collapsed and later been covered over with field clearance. 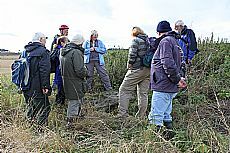 The landowner Hector Munro remembers the corner of a structure being visible years ago, perhaps a hint at foundations that lie partially intact beneath the stones. Many field clearance sites utilise areas that already have stones that prevent ploughing and several examples that have been investigated have revealed a number of interesting structures beneath, ranging from old farm buildings to early prehistoric chambered cairns. The corner of the overgrown site in plughed field. This site is not only interesting because of the various possible interpretations but also because of the wider landscape that it sits in. A possible early routeway runs to the south of the site which has prompted interest in Cnoc an Teampuill and other sites in the vicinity. The recently excavated mound at Foulis and the current Foulis Castle are two of a number of significant sites that lie within several hundred metres. These connections might imply that the site at Cnoc an Teampuill is more significant than a pile of overgrown clearance stones. More information on the recent ARCH excavation project in this area will be available to view soon. Keep your eyes on the newsletter for dates and locations of the community display. The display will present the work done on the Foulis estate and include information on the sites in the region. To find out more about other sites along this early routeway you are welcome to visit the community display at Milton Mercat Centre. This will be on display from 15th December and showcases some of the sites of interest in the Milton region of the route.